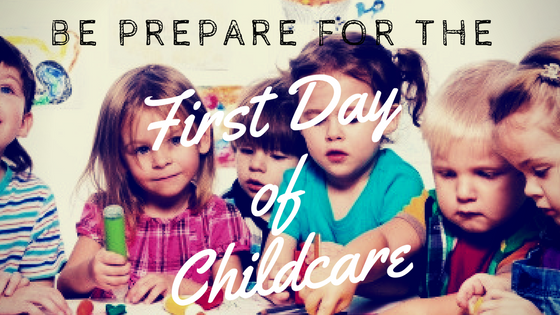 The first day of child care is a momentous occasion for a parent and a child. We parents are sending our children out into the world, entrusting them to others. Our children are entering a new environment where they'll be surrounded by other children and nurtured by new adults. Although you've carefully selected the child care program and feel secure that it's a good fit for your family, as the big day approaches, you might be wondering: What if he doesn't want me to leave? What if the teachers can't understand what she wants? What if he cries? You can feel more confident and ensure the smoothest transition for both you and your child with a bit of preparation for that first day of daycare or child care. Of course, how you do so will depend upon the child's age, temperament, and level of maturity. Trust your judgment that you selected a child care setting where your child will be happy and receive nurturing care and love. Begin to develop a relationship with the teachers/caregivers before the first day. Keep the parent/teacher communication open and ask lots of questions and share anxieties you might have about your child starting child care for the first time. Teachers are professionals trained to support parents and children through the adjustment period. Understand that children react to new situations in different ways. Discuss your child's temperament and possible reactions to this new place with the teachers before the first day. Ask the teachers to help develop a separation routine; ask about what you should do upon arrival and how long you should stay the first day. On a prior visit to the daycare center with the child, take a couple of photos of learning centers (avoiding other children) to share with your child at home. Talk about the fun playground or the book area that they will get to visit again. Start your family on the new evening and morning routines at least a week before the first day of child care. If you can do longer than a week, that is even better. Pack everything you need the night before, and place it in a special spot. Label everything that your child will take on the first day: clothes, bottles, bottle tops, food, backpack, diapers, binkies, and cuddly toys for nap (Note: Some schools do not allow blankets or cuddly toys for infants so be sure to check ahead). Make sure to schedule ample time on your work calendar, so you don't feel rushed, have time to help your child get settled in, and be able to take a few minutes for yourself afterwards. Remind your child about the upcoming event. Talk about friends who already go to child care or school. Reminding children of the teachers' names and some of the school activities will help them feel that school is a familiar, safe, and fun place. Preparation for the first day of daycare or school will vary based on your child's age. All children will notice that something new is happening, but will react to the change in different ways. Babies may be a little fussier than usual. Older children may be a little clingier. Keep your emotions in check. Often times, adjusting to first day of child care for parents can be tough, but make sure that your emotions and actions are aligned in front of your child. Children receive a confusing message if you're tearful as you describe how happy they're going to be in this "wonderful, fun place." Involve your child in preparing for the first day of child care. Have him help select what he wants to wear, pack the backpack, and select a cuddly toy for nap time. You might give your child a family photo to put in a backpack. For toddlers and above, explain what will happen during the morning of their first day: "We'll get up and get dressed, have a nutritious breakfast, and then drive together to child care. I'll stay for a little while, and we will read a story. Then I will give you a big hug and kiss and go to work, just like all the other parents. We'll give Naomi, your teacher, your yellow blanket and teddy bear to put in a special place for naptime." For preschoolers and pre-kindergarteners, describe the entire plan for the first day of preschool. "After I say goodbye, you'll stay at school with the children. Your teachers, Naomi and Bruce, will take good care of you. You'll play, and then eat lunch sitting at the little tables. Then everyone takes a nap. In the afternoon you will play lots more and have a snack. After late-afternoon story time, I'll be there to pick you up!" For older children, you might put a note in the lunchbox or backpack to say how excited you are for your child and how you look forward to hearing all about his/her first day of school. Keep the home environment as consistent as possible. This is not the time to make major changes or transitions in the child's life, like moving to a bed, stopping the bottle, or starting toilet learning. Be sure to introduce bottles to nursing infants at least a few weeks before they start child care. It's easier to make the transition to a bottle at home rather than at the child care center. Wake up early enough to get ready for school without rushing. Enjoy a leisurely breakfast and remind your child about the plan for the day. Allow ample time for the transition from home to child care. Upon arriving at the center, spend a few minutes reintroducing your child to the teacher. Spend time with your baby and caregiver. Talk to the teacher about your baby's evening and morning, and then be sure to give all necessary instructions both verbally and in writing. Help your toddler or preschooler child find an activity he likes and join in for a few minutes before having to leave him. When it's time to leave the child care center or school, create a goodbye routine. Give your child a cheerful and confident goodbye. Reassure your child that you'll be back at the end of the day and when, for example, "after story time." Never sneak out during the child care drop-off. Always tell your child you are leaving. Although it might be tempting, sneaking away when your child is engaged in an activity will likely cause him to have a harder time trusting when you will leave and when you will return. Let the teachers know when you are ready to leave. Teachers want to nurture children through the transition and need to know when to help your child say goodbye. Say goodbye to the teachers. Leave quickly; don't linger at the door. After you leave, reflect upon the morning. It's normal to feel a bit anxious or concerned during child care drop-offs. Call the daycare center any time for updates and reassurance. Understand that it's normal for many children to shed tears, scream, or beg you not to go. If this happens, think about the happy children you saw during the pre-visits or ask for a call later. Be careful not to judge the class by drop-off time. This is one of the most hectic times of the day and isn't usually typical of the rest of the day. Remind yourself that your child is in a wonderful child care setting, playing, learning, enjoying new experiences, and developing relationships with teachers who will do everything possible to help him feel secure and happy.